This week’s highlighted birding t-shirt is actually a twitching t-shirt. You’ve heard of witchcraft, but have you heard of Twitchcraft? Twitching is a method of birding by which birdwatchers follow tips and sighting reports in order to see rare birds. Sometimes twitching is also used to generically describe British birders. 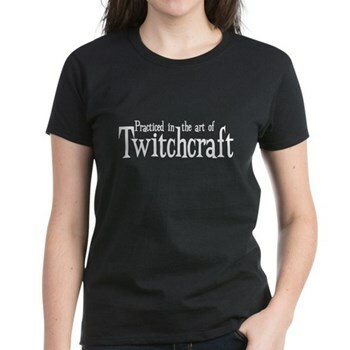 This fun twitching-themed t-shirt design reads Practiced in the art of Twitchcraft. This entry was posted on Tuesday, February 3rd, 2009 at 9:40 pm CST and is filed under T-Shirt Tuesday. You can follow any responses to this entry through the RSS 2.0 feed. You can leave a response, or trackback from your own site.